Temporomandibular disorders (TMD) pertain to a variety of disorders that affect the temporomandibular joints (TMJ), jaw muscles and facial nerves. TMJ are the jaw and joint muscles located on each side of the head. They are responsible for opening and closing the mouth so you can speak, chew or swallow food. The TMJ also controls the lower jaw so it can move forward, backward and side to side. Diagnosis is essential before starting any treatment. Your dentist will check your joints and muscles for any signs of soreness, popping or clicking, locking, limited range of motion and inspect your bite. Panoramic x-rays may be taken. Your dentist may refer you to a maxillofacial surgeon (oral surgeon for treatment depending on your symptoms. See a dentist immediately if you feel any of the symptoms stated above. Surgery is your last option. Make sure to seek 2 or 3 professional opinions first before submitting yourself to surgery, as it is irreversible. 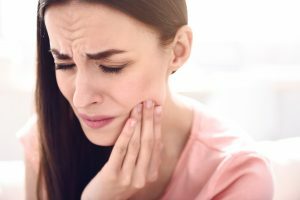 Visit Dr. James Voyles in Hilliard if you suspect of having TMD.